Jim Bentley has called on his Morecambe players to replicate their away form at the Globe Arena. The Shrimps moved back into the League Two play-off places on Tuesday night with a 2-1 win at Notts County. That made it four victories in the last five league matches away from home with 13 of their 19 points this season coming on the road. In contrast, their home form has stuttered of late. Back-to-back wins over Blackpool and Portsmouth in August have been followed by five defeats in their last six games at the Globe ahead of tomorrow’s meeting with Stevenage. “I keep saying I wish we could do it in front of our home fans,” Bentley said. “I think the 74 (who travelled to Notts County) will be proud as anything of their players. “We prepared right and gave it a right good go. They are going to make mistakes here and there but we were solid. We’ve been pretty solid on the road but we don’t seem to be the only ones. “MK Dons haven’t won in six and Exeter haven’t all season in the league. “You don’t always get what you want in life but Notts County was a fantastic win and sets it up for a home game on Saturday. Tuesday’s three points came amid the continuing rumours linking Bentley with the vacant managerial role at Shrewsbury Town. 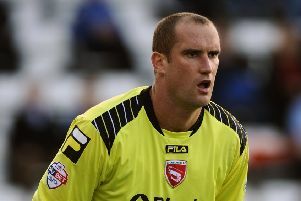 He remains one of the frontrunners to replace Micky Mellon, following his move to Tranmere Rovers. Other names in the frame include Wolves coach Rob Edwards, former Molineux boss Kenny Jackett and ex-Fleetwood Town manager Steven Pressley. Having batted away the rumours he was set to swap Morecambe for Tranmere, Bentley reiterated the position he took after last Saturday’s loss to Carlisle United..
“I haven’t been told anything,” he said. “All I’m interested in – and I’ve said it all along – is preparing the team. “All the stuff with Tranmere and I was trying to get a result at Barnet – and it was the same with Carlisle. “I love the club. I’ve been here a long time and all I was interested in was getting the job done. “There are going to be ups and downs this season but I could go in depth about how hard it’s been and blow my own trumpet. “We feel, as a staff, that we’ve done well and the players have given it their all. “There is a new ownership now and there seems to be a new vision. “It won’t happen overnight – it’s a case of laying the foundations on and off the pitch and, hopefully, the future is bright for Morecambe Football Club.